From the top floor of the Hyatt Hotel on Lady Bird Lake, this is the view of Austin skyline on a perfect May afternoon. All the prominent high rises can be seen here - the Austonian, the 360 Condos, 100 Congress, the Frost Tower, the Ashton, and many others This late evening photograph was taken on one of the calmest days I’ve seen on this stretch of the Colorado River as it flows by the downtown area. 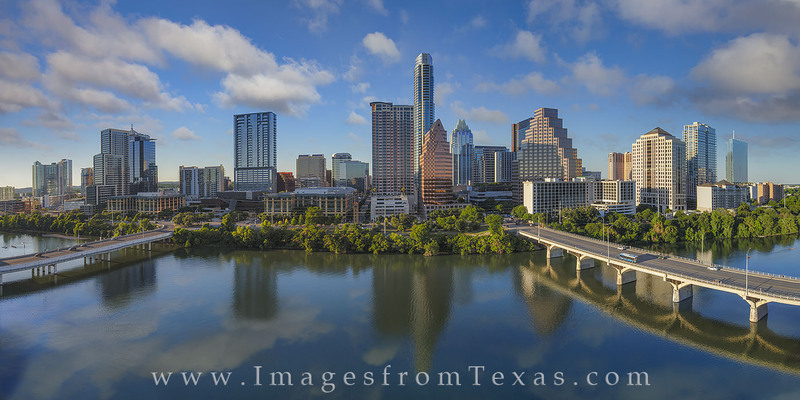 This Austin panorama is available in larger and custom sizes.